Do you know what is that thing in marijuana that dozes you off every time you take it? Well, you must have heard about pot, but you may not know about cannabis. It’s a plant genus from which, the two natural addictive compounds are extracted. The first one is Cannabidiol (CBD) and the second one is Tetrahydrocannabinol (THC). The latter is what makes you “high” when you take marijuana. The higher the THC level, the more relaxing it feels. You will get to know about the highest level of THC strains and some other related stuff as the article unfolds. That’s what this post is all about! Remember, you can’t just take high levels of THC nonchalantly as your body can bear only a certain level. Therefore, always know your physical needs and don’t beat yourself up with a lot of drugs. Are THC and CBD Really Different From Each Other? Have you ever looked at the ingredients of the drug you drink? You must have read THC at the back of the bottle and might have confused it with CBD as they look pretty much alike. Extracted from the same genus and having almost identical chemical structure, both of these compounds aren’t functionally similar. The CBD is found in the hemp plant and is used in different extracts, oils, gels, gums, and supplements. On the other hand, THC is present in marijuana, and this is the compound responsible for making you high. However, it is also used in capsules, oils, and other edibles. Both the hemp and marijuana are the babies of the parent cannabis plant. The only difference between CBD and THC is that the former isn’t psychoactive, but the latter is. Both of these interact with the Endocannabinoid System (ECS) that is actually a bunch of receptors responsible for performing some essential functions. They communicate similarly but work absolutely differently. This seems like a minor dissimilarity, but that’s what makes all the difference! So, basically, it’s THC you crave for and get addicted to. Is CBD: THC Ratio Really Helpful? As mentioned above, both are products of the cannabis plant. Despite having obvious functional differences, the CBD-THC ratio counts while making medicinal and recreational drugs. During extraction, both the CBD and THC-dominant species are taken out and are examined under strict laboratory conditions. Then, their contents are calculated, and the CBD and THC-dominant strains are separated out. However, those that lie in between are called “balanced strains” and are used for different purposes. The ratio helps in determining whether to use the strain for recreational or medicinal purpose. Whenever you get high, remember its THC working inside your body. It goes directly to the ECS and creates extreme relaxation by lessening your aggression. Other than that, it also alters your senses of sight, hearing, and smell. Enough with the recreational effects! Let’s now talk about some medicinal benefits. The THC also helps in treating chronic pains and inflammations, HIV/aids, nausea, digestive problems, multiple sclerosis, and other health issues. However, it doesn’t work individually but along with other drugs and medicines. The high levels of THC used as drugs have some temporary side effects including dry mouth, elevated heart rate, short-term memory loss, redness of the eye, and coordination problems. However, it can also have long-term effects if used abundantly. Like I told you, THC is the primary compound of marijuana responsible for creating high-dose of recreation. But, have you ever thought where it is produced? Which is the biggest cannabis market in the world? Honestly speaking, it can be grown in any country under recommended conditions. Thanks to modern technologies, it is now produced indoors in developed countries. There are two significant types including herbal cannabis and cannabis resins. You can also call the first one as marijuana and the second one as hashish. So, we are mainly interested in the former because that’s what we are talking about here! The American continents and Africa are known for producing most of the THCs. However, North Americans and Europeans are now working on indoor production by utilizing various agricultural techniques and technologies. Two of the most commonly used methods are “cross-pollination” and “fostering” different types of strains. The indoor horticulture has been more successful because the grower is in control of the environment. He is in charge of altering the atmosphere according to the requirements. However, outdoor growth depends on Mother Nature. Other countries that are known for producing and exporting marijuana include South Africa, Srilanka, Kazakhstan, Thailand, and Nigeria. It is supplied in the form of compressed bricks across the globe or within the manufacturing countries. Which Cannabis Breed Has the Highest THC Level? Well, according to the general perception, Sativa (the oldest known cannabis breed) has the highest level of THC. But, the realities unfolded with technological advancements and research development; therefore, it has now been replaced with other strains. There are different breeds known for having the highest THC levels, but not all are true. 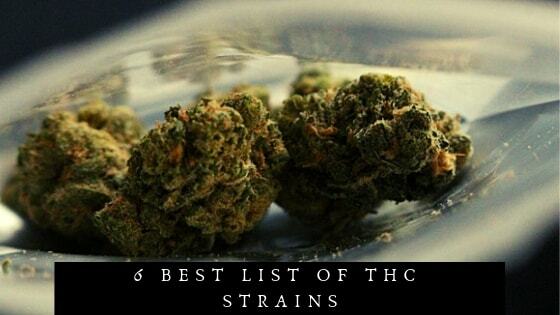 I have done some in-depth research for you and have made a list of 6 best THC strains for you. Have a look! This one is a mysterious strain as its origin and history are pretty much unknown. However, it’s a word of mouth that it is a cross between sativas of Nepal and Thailand. Whatever its origin is, one thing is for sure! It’s an adult-only product because its Indica dominant nature makes it extremely strong and bearable for mature immune systems only. Its scent resembles with that of diesel, and that’s also what it’s famous for. Due to its high THC level, it won the Cannabis Cup Title a few years ago. It also came under the top five most potent strains of 2019 for having 31% of THC. Whenever you need to relax in the middle of your exhaustive routine, take Chemdawg, and it will uplift your mood in seconds. The drug is famous for creating soothing and relaxing effects inside your body. Thanks to the technological development that we are now able to calculate the strain strength in a lab. Yes, you can actually define it in quantifiable terms. That’s what happened while calculating how strong Ghost OG is. We know that its cannabis content that determines the strength of the strain, but we are still interested in its THC content. Due to the advanced indoor horticulture, cannabis plants are now able to produce 25% of THC stains. However, the Ghost OG even surpassed these statistics. It has 28% THC that makes it the second most recreational strain that dozes you off soon after the intake. Perfect for creating a euphoric feeling, this one gives you exactly what you need on holidays. It is obtained from the parent OG Kush and is carefully harvested for recreation. Another THC strain that makes you euphoric, happy, relaxed, and uplifted is the Bruce Banner. It has been maintaining its position since after winning the Denver Cannabis Cup 2013 and the award of the most potent strain by High Times in 2014. With approximately 24% THC level, this strain also enables your brain to think creatively. So, if you are in search of a business idea or other related stuff, have a vessel full of Bruce Banner and start jotting down important points. The Gorilla Glue # 4 a.k.a. Original Glue has been under researchers’ eyes to know some statistics. Unlike the strains mentioned above, this one is responsible for making you more relaxed not euphoric. After being under several laboratory tests, the 20% THC content has now been declared. The “#4” after the name indicates this isn’t just one strain. The Gorilla Glue isn’t a strain but a company that named its first strain as the Gorilla Glue #4. Later, Gorilla Glue # 5 (the new glue), and Gorilla Glue #1 (the sister glue) were produced and came into the market. Having a high THC level of 19% and strong genetics, it is a Californian-special drug product. It is compelling in terms of strength as it’s a mixture of Durban Poison and OG Kush. There are different types of GSCs with varying levels of THC; however, they all revolve around 19%. You may come across even higher THC level in GSCs, but they aren’t true. It may give an Indica-like feeling, but it’s doesn’t have it! It works more like sativa as it makes you uplifted, happy, and enthusiastic. Are you looking for something euphoric to make you relax meanwhile increasing your potency? The THC level of this strain ranges from 20 to 28% that is really a high percentage. Originally named as “triangle,” it was renamed as “the white” due to the white trichomes that give an appearance of a bud covered in snow. It resembles a lot with the OG Kush in function; however, it doesn’t have a noticeable smell or flavor. This, again, is a very potent strain available in three flavors including earthly, pungent, and pine. Unlike GG and GSC, this one makes you more relaxed than euphoric or energetic. Putting it all together, it’s THC that determines how strong your marijuana is. The cannabis plant produces two compounds abbreviated as CBD and THC, and it’s the latter we are interested in. It’s THC that takes you to the seventh sky with its recreational and euphoric properties. There are hundreds of cannabis strains with a high THC level. However, some of the highest ones are Chemdawg, Ghost OG, Bruce Banner, Gorilla Glue (GG), the Girls Scout Cookies (GSC), and the White. So, do you plan to buy any of these strains and find the enjoyment you have been looking for? Next articleHow To Identify CBD Oil Colors?